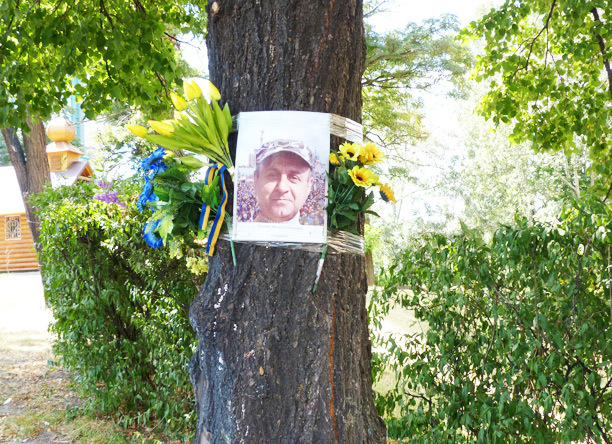 My husband and I visited Kiev and Poltava in August this year between the 15th and 23rd of August. We went with some trepidation as the friends and relatives we wanted to visit said nothing to either encourage or discourage our visit, only commenting that their cities were quiet but no guarantees could be given that trouble would not break out during our stay. In the event we were all grateful we went ahead with our travel plans to Ukraine as it was a morale booster that took their minds off the fighting in the East. 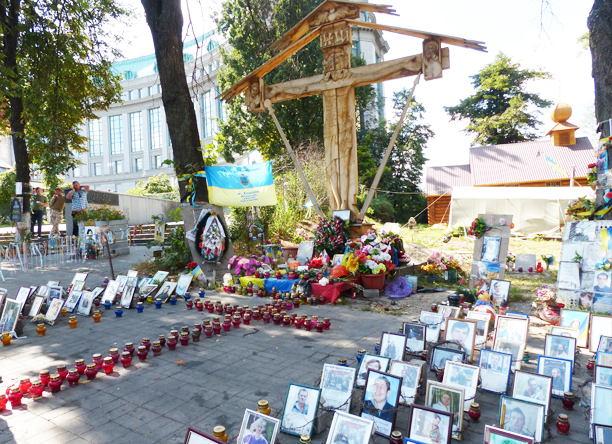 Beautiful Kiev was noticeably subdued this year and it was sobering to be in the Maidan area. 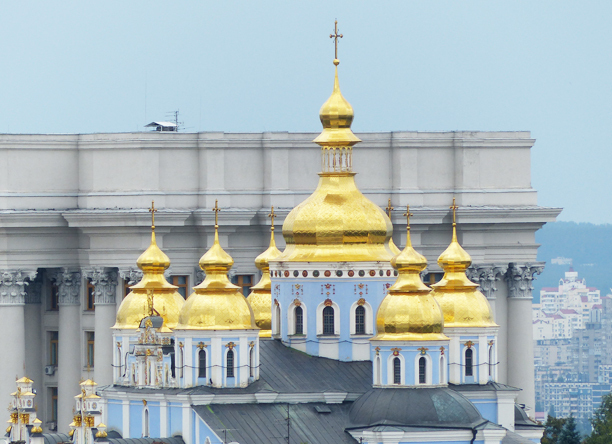 We always like to stay in the Ukraina hotel that affords such a wonderful view of this historic location. 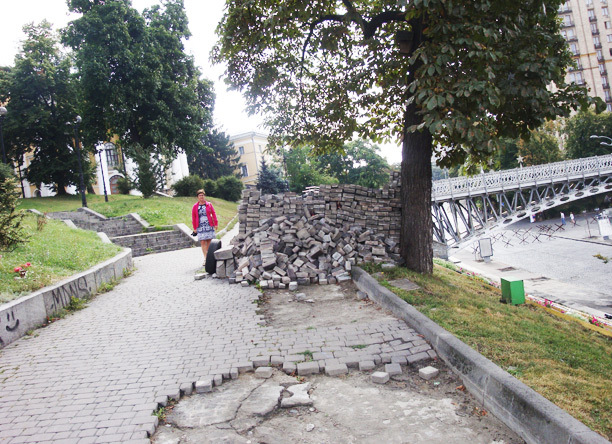 It was sad to see the damage, the barricades that were still around, the debris and particularly the absence of the many fountains and gardens that usually beautify the area. We missed the café opposite the clock that must have been obliterated in the fighting as no sign of it remains except the damaged walls against which it was built. It was very sobering to walk around the area as so many shrines had been erected to honour the young men and women killed in the battles. People came each day to stand before the photos and wreathes, to pay their respect, pray or just reflect on the terrible loss of life in this conflict. 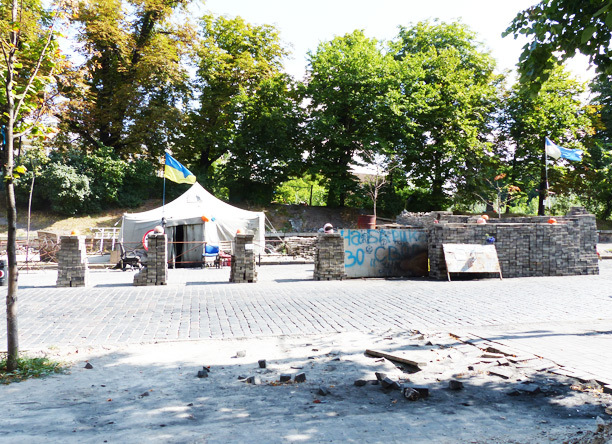 The area was just starting to be cleaned up with work groups re-laying cobblestones, removing rubble, repairing fountains and restoring gardens. We left the day independence celebrations were to be marked which no doubt explained the motivation for the round-the-clock work we saw. Unfortunately, there is so much infrastructure that needs attention in Kiev and Ukraine generally one wonders how the country will cope with the burden but hopefully this is one area where aid might be directed. 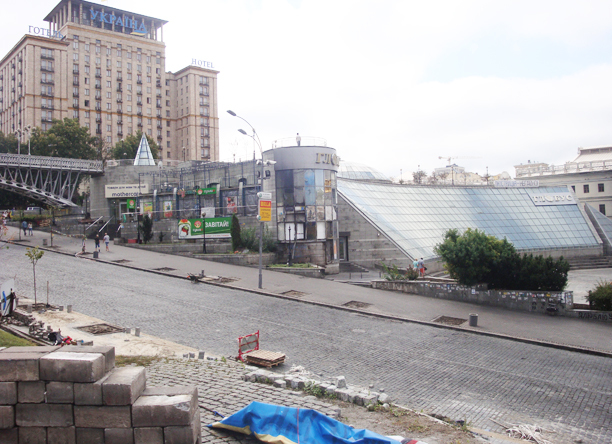 It was much quieter in the Maidan area of Kiev this year with fewer people out and about as in previous years. With none of the fountains working, until our very last day there, we missed seeing children playing in the fountains and people wading in the water cascading over the steps leading down to the footpath. Kreschatik street also seemed to be less vibrant this year on the nights it was closed to traffic and this absence of people and sound contributed to a more sombre mood in the place. 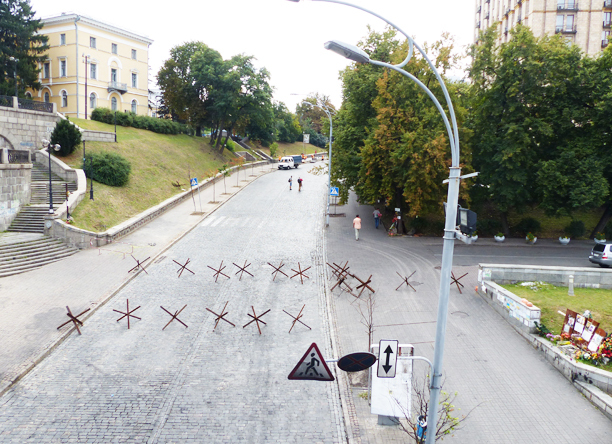 However, we felt a marked difference in the Ukraina hotel. The Ukraina was centrally positioned in the fighting, thus serving as a hospital and command headquarters during the conflict. In previous visits we were struck by what we perceived as a soviet mentality in the running of the hotel. This year hotel staff seemed more friendly and flexible with a less suspicious manager/housekeeper stationed on our floor. We noticed with concern that breakfast was a much less lavish offering with only half the dining floor open and very few guests. Whilst in Kiev and Poltava when the fighting was intensifying in Donetsk it was striking to observe the normalcy of peoples’ lives. People continue to go about their daily tasks but the fighting created considerable tension. Families have become divided in their loyalties as they struggled with opposing viewpoints. The plight of inhabitants from Donetsk and Luhansk fleeing their war torn regions and elderly relatives trapped in the villages close to and within these conflict zones was also ever present. At a celebratory dinner with friends and their family to celebrate the feast day of the Transfiguration, we witnessed a man and woman spend their entire evening trying to contact their respective parents as news came to hand about renewed fighting where their relatives live. 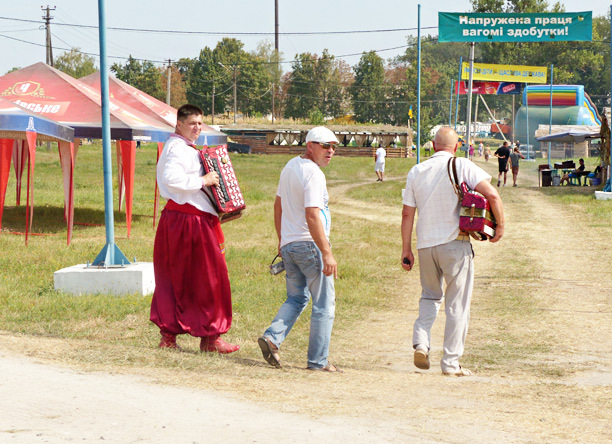 Whilst in Poltava we were fortunate to be taken to the famous Sorochyntsi fair. Apparently there had been some controversy about holding it given the situation in the east however it went ahead but was considerably smaller than usual and contained a strong military and police presence. It was wonderful to experience a typical fair where the cultural and ethnic differences to my own country are so marked. The most delightful events were the singing and costume displays. 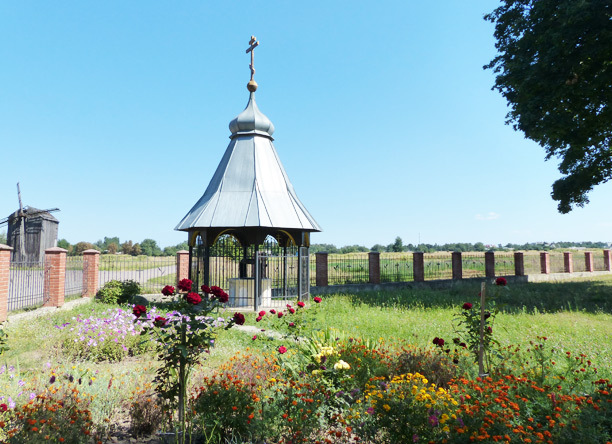 On our way to Sorochyntsi we passed through Dikanka , Gogol’s birthplace, and paused at the church of St Nicholas where Gogol’s mother prayed for her son. It is also the church where our guide and dear friend was married. We also took the opportunity to pause in nearby woods to view ancient oak trees and revel in the fresh air. After the fair, somewhere between Dikanka and approximately fifty kilometres from Poltava we stopped for a typical Ukrainian picnic by the river. This was a wonderful treat where amongst other delicacies, we enjoyed potatoes stuffed with garlic and sala that had been wrapped in foil and cooked in the coals of our fire. It was a leisurely, family affair where the youngest member alternated between swimming, fishing and accidentally throwing the boomerang we had given him into the trees which the adult males repeatedly rescued with amazing feats of throwing and climbing throughout the afternoon. After a long leisurely meal, walk along the river and through paddocks we headed from home just as it was getting dark and were treated to an eerie mist that had wafted in over the fields. The only blight on the afternoon was meeting a couple camped by the river who had been there for a week after having fled from Donetsk. 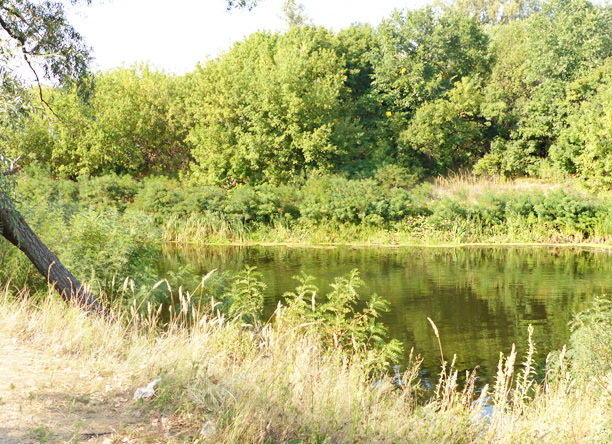 They were living out of their van, fishing for their meals and were biding their time in the tranquility of the area. It was sobering for us to meet fellow ‘tourists’ in such different circumstances. Hopefully, the current shaky truce will hold and the country will rebuild. Ukraine is a beautiful country with wonderful natural resources and talented, hard working people. On my first visit in 2011 I gained an awareness of the impact geography has on history and politics. 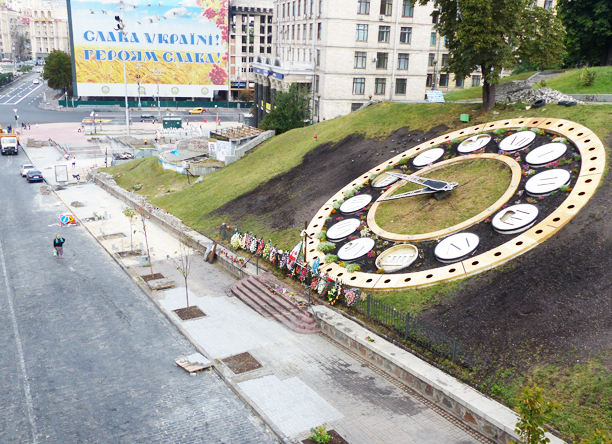 Hopefully Ukraine will finally realize its dream of peace and independence. I would certainly urge people to travel to Kiev to provide a much needed boost to their economy and with the exchange rate being so much worse for Ukraine, tourists would also be benefiting.